Arnold Schwarzenegger has been forced to put his acting comeback on indefinite hold. Arnold Schwarzenegger was set to make a comeback in multiple realms of media after his run at California governor ended, but alas, it doesn't look like that's going to happen. The Governator's lecherous lifestyle has caused him to renege on the idea that he'd "be back" after all. Schwarzenegger had planned to star in properties such as a new Terminator film and a superhero cartoon/comic book called Governator. Unfortunately, a wrench was recently thrown in the works when it was revealed that he fathered a love child while married to current wife Maria Shriver. The two have separated over the scandal. TMZ reports that all of the entities behind Governator have "chosen to not go forward." They wouldn't say if the series was entirely cancelled or not, but considering how the series follows the contrast between Schwarzengger's wholesome family life and his secret superhero life, it's now a tough sell. Schwarzenegger's lawyer also released a statement related to his planned live-action projects. "At the request of Arnold Schwarzenegger, we asked Creative Artists Agency to inform all his motion picture projects currently underway or being negotiated to stop planning until further notice," it says. "Gov. Schwarzenegger is focusing on personal matters and is not willing to commit to any production schedules or timelines. This includes Cry Macho, the Terminator franchise and other projects under consideration. We will resume discussions when Gov. Schwarzenegger decides." 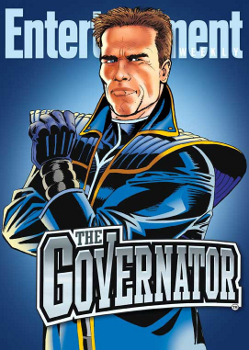 In one respect, this is probably a good thing, because that Governator series looked a little strange. On the other hand, I wouldn't have minded seeing an aged Schwarzenegger blast a few more liquid robots with a shotgun while reloading it with a twirl on the back of a motorcycle. You take the good with the bad, I guess.